Going to Yellowknife in early March to chase the Northern Lights. Anything I shouldn’t miss? It was FABULOUS. I recommend it unreservedly. But be sure to allow yourself at least three nights there. 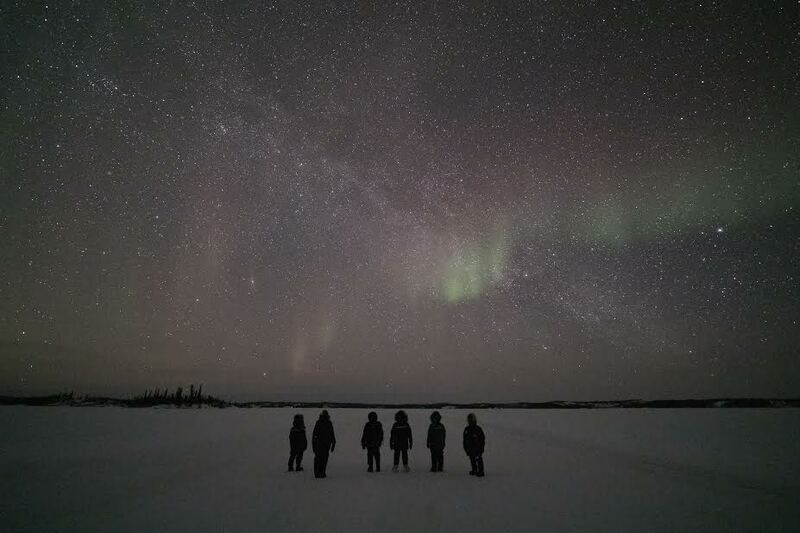 We had four, and we were very lucky: on two the Aurora was good and on two it was spectacular. The days on each side of our trip, though, were cloudy. Also, be sure to rent Arctic clothing. You’ll need it. If you want a great experience, hire Sean Norman as your guide. Cool thanks for the update! Any pictures? Is arctic clothing considered like parkas and heavy coats? Yes, super heavy parkas, insulated pants, and heavily insulated boots. The boots are crucial. You’ll be standing for 4 hours on a frozen lake in -20F and you won’t want to go back in the van to warm up because you might miss something. As for photos, here’s me and my buddies watching the Aurora (upper right to lower left) cross the Milky Way (upper left to lower right). Tell me if it comes through. This is gorgeous! Thanks for coming back to share it with us!